Neuroscientists have for the first time mapped the sensory and motor systems in the brains of dolphins. 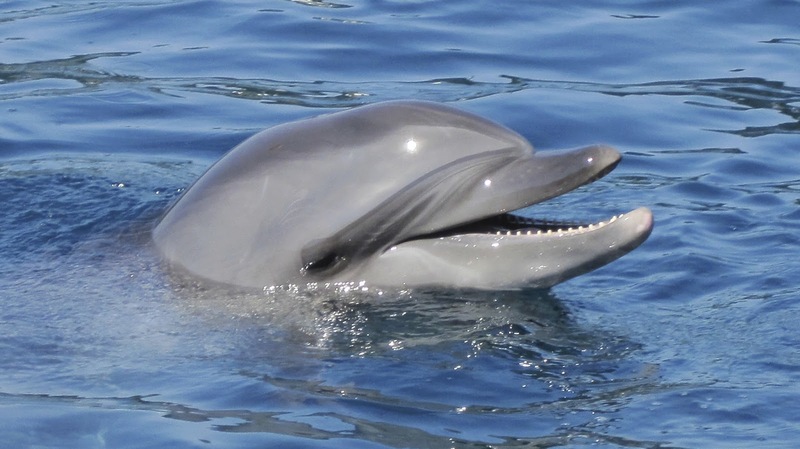 Proceedings of the Royal Society B is publishing the results, showing that at least two areas of the dolphin brain are associated with the auditory system, unlike most mammals that primarily process sound in a single area. The researchers applied a novel technique of diffusion tensor imaging (DTI) on the preserved brains of two dolphins who died after stranding on a beach in North Carolina more than a decade ago. The method for using DTI on a non-living brain was developed relatively recently and had previously only been used for research on deceased humans, primates and rats. Dolphins emit clicks, squawks, whistles and burst-pulse sounds to communicate, navigate and hunt. Echolocation allows them to perceive objects by bouncing sound off surfaces. Formerly on the faculty at Emory, Marino is currently the executive director of the Kimmela Center for Animal Advocacy in Utah. Emory houses a number of preserved cetacean brains collected by Marino, via colleagues at the University of North Carolina, Wilmington, from stranding events. Various environmental agencies respond when dolphins and whales are beached, in an effort to save the animals and return them to the sea. If the animals die, parts of them may be preserved for use in scientific research. The current study used the brains of a common dolphin and a pantropical dolphin from the Emory collection. Previous investigations using magnetic resonance imaging (MRI) have revealed the complex anatomy of cetacean brains. But MRI scans only capture images of the brain’s basic structure. DTI focuses on the brain’s white matter, or the fiber pathways that connect neurons and different regions of the brain’s gray matter. DTI can detect the movement of water molecules along these fiber tracks. The researchers used a special DTI technique for post-mortem brains developed by study co-authors Sean Foxley, Saad Jbabdi and Karla Miller at the University of Oxford. In a living, human brain, a DTI scan takes about 20 minutes. Scanning a post-mortem brain takes much longer, however, since it contains less water. The dolphin brains posed a particular challenge since they are large – about the size of footballs – and had been preserved for years. They retained only small amounts of the water normally found in healthy tissue. 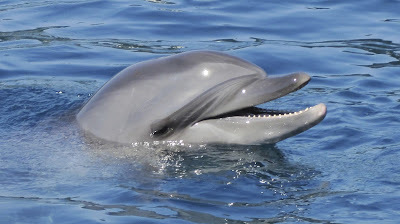 The researchers hypothesize that dolphins have more than one neural area associated with sound because they are using sound for different purposes. “The signal was very weak, but it was there,” Berns says. “Each of the specimens required nearly 12 hours of scanning.” The data from the DTI scans allowed the researchers to map out the white matter pathways, essentially the wiring diagram for the dolphin brain, in high detail. 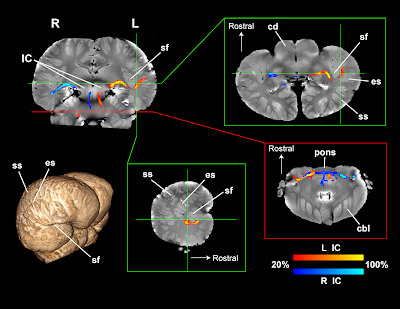 The results show that the dolphin auditory nerve enters the brain stem region and connects both to the temporal lobe (the auditory region of many terrestrial mammals) and to another part of the brain near the apex known as the primary visual region. The researchers hypothesize that dolphins have more than one neural area associated with sound because they are using sound for different purposes. The researchers hope that their map of dolphin neural circuitry will help unlock secrets of the dolphin mind, including how they communicate and perceive their environment.